At Carolina Coatings & Tile, Inc., we utilize many different types of protective flooring materials for our residential, commercial, and industrial coating solutions. All formulations can be applied significantly thicker than many other protective coatings in the market. 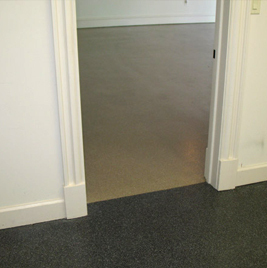 Our basement flooring formulations are the ideal protective barrier against spills, water leaks, or leaking hazardous material seeping into the surrounding environment. To learn more about the many protective flooring options we offer for your Raleigh home’s basement, please contact Carolina Coating & Tile, Inc. today via phone at (919) 795-3597, or submit an online request form located on this page.